Fritzen and Kern's final research papers were published in WIRR. 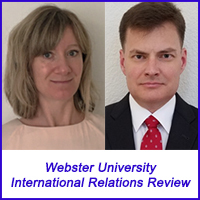 The Department of History, Politics, and International Relations in Webster University's College of Arts & Sciences congratulates students Charles Kern and Katharine Fritzen for the publication of their final research in the Webster International Relations Review: The Graduate Student Working Paper Series (WIRR). WIRR is a competitive, peer-reviewed journal that publishes the best graduate research papers from Master of Arts and Global Master of Arts students in international relations. In his paper, "North Korea’s Asymmetric Warfare Strategy: The Critical Role of Nuclear Weapons in National Security Objectives," Kern demonstrates that traditional efforts by the international community to prevent nuclear weapons proliferation are ineffective when dealing with North Korea. He argues that the country is unlikely to give up its nuclear weapons program because it is critical to the successful completion of its national security objectives, such as international recognition, regime survival, and Korean unification as a communist state. Using qualitative analysis, Kern concludes that North Korea’s nuclear weapons program provides the country leverage to attain economic support in addition to feeding the country’s national identity as a strong and prosperous state. Fritzen takes an in-depth look at one of the largest recipients of foreign aid in her paper, "The Impact of Corruption, Conflict, and Donor Interests on Foreign Aid Effectiveness & Human Development in Pakistan." She utilizes case studies and statistical evidence to argue that the aid provided to Pakistan has not contributed to significant advancements in human development, measured by the population’s access to education. She identifies that corruption within the Pakistani government, regional conflicts and domestic terrorism, and donor interests are key factors in limiting foreign aid effectiveness. Fritzen then examines how the factors limiting foreign aid effectiveness have influenced the allocation and use of foreign aid and describes their impact on Pakistan’s education sector. Nominations for publication in WIRR are solicited from department faculty throughout the year and nominated papers are reviewed by the WIRR Editorial Board. Congratulations to both Charles and Katharine for exemplary research in the field of international relations!